Synopsis: In this second Crowfield adventure, it is March 1348. Evil lurks in Crowfield Abbey and the building is starting to collapse. Fay creatures have fled the surrounding forest in terror.Repairs begin and William is given the job of lifting floor tiles in a haunted side chapel. There he finds a box from an earlier pagan time containing a small wooden bowl, covered with strange warnings and symbols.The bowl is cursed and a hideous demon is unleashed within the Abbey’s walls, that will wreak unspeakable havoc. Can Will and his friends summon help in time or is it the end of Crowfield forever? The Crowfield Abbey is crumbling away, tormented by freak storms and a mysterious shadow that lurks in the corners, haunting the stone masons who are attempting to repair the damage. But there is still greater damage to be done and a deeper, nastier secret to uncover – the secret of a demon who seems to be waking from his slumber to steal Will’s soul from him. 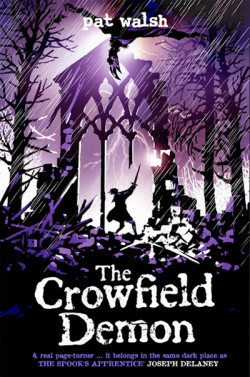 The Crowfield Demon is the second novel in Pat Walsh’s gothic historical fantasy series aimed at preteens, and follows on from the mysteries presented in The Crowfield Curse while expanding on them and deepening the intruige of the novel. When I read The Crowfield Curse, I was pleasantly surprised to find such an interesting novel that was both well written and a good read, and The Crowfield Demon is no different. While it may be aimed at 9-12 year olds, it still makes for some good (albeit lighter) reading. It is unique in that it is set in medieval Britain, includes fantastical and Christian elements such as fays, hobs, angels, demons, and is primarily set in an abbey. The unusual setting for a preteen (or even YA/adult novel) allows The Crowfield Demon to stand out from the crowd and will, I’m sure, attract older readers such as myself. Having been written for those aged 9 and above, the plot is not complex or difficult to understand, and for those looking for a heavy and thorough historical fiction will be disappointed. The story in itself is fun and enthralling and best of all, fantastical. Walsh’s concoction of Christian thinking and fantasy is interesting and might spur some questioning from youngsters – which most books can’t say they can do for 9 year olds. The Crowfield Demon is also darker than its predecessor. It is no longer just about a dead angel, but also about a bloodthirsty demon, which is surprisingly scary. I found myself feeling rather vulnerable whilst reading The Crowfield Demon just before bed, and I’m sure it’ll provide some scary (and wanted) thrills for younger boys who I’m sure will love to be slightly put on edge! The Crowfield Demon is a pleasing read that, although having been written for those in the later years of their primary school education, will also appeal to anyone with a taste for a historical fiction with a fantastical twist that isn’t too taxing to read. The plot is enjoyable and filled with plenty of interesting (and cute!) characters, and Pat Walsh’s writing is both atmospheric and easily read.